What are you going to do if it rains? Provided there’s no lightning, the race will go on. If there is lightning, we will postpone the race for up to an hour at the latest. If we cancel the race due to weather, there will be no refunds issued since this is a fundraising event benefiting children. Who am I helping at the CASA Superhero Run? You are helping children in Travis, Williamson, Guadalupe, Comal, Hays & Caldwell counties who've been abused or neglected. CASA speaks up for children by empowering our community to volunteer as advocates for them in the court system. When the state steps in to protect a child’s safety, a judge appoints a trained CASA volunteer to make independent and informed recommendations in the child’s best interest. What difference does CASA make for children recovering from abuse or neglect? A study by Texas Appleseed, "Improving the Lives of Children in Long-term Foster Care," reports that "If a child has a CASA, the CASA usually is the only person who truly knows the child and knows how the child is really doing." National CASA reports that children with CASA volunteers are more likely to receive therapy, health care and education, more likely to do better in school, less likely to be bounced from one place to another, less likely to get stuck in long-term foster care and significantly more likely to reach safe, permanent homes. A CASA volunteer is often the child's only link to maintaining family connections and can be instrumental in identifying family members as temporary or permanent placement options. Most importantly, children themselves report that they know and can rely on their CASA volunteers. How can I learn more about CASA on race day? Find one of our volunteers in a blue "Ask Me About CASA" cape or visit the "Learn More About CASA" booth in the exhibitor area. We would love to talk with you! What is the Austin Distance Challenge? The Austin Distance Challenge is a series of the most prestigious local running events starting in the fall and leading up to the Austin Marathon & Half Marathon in February. The races increase in distance as the series progresses, making the series a natural component of many Austin runners’ training. In its 22nd year, the Distance Challenge is hosted by the Austin Runners Club (a 44 year old local nonprofit). Participants sign up for the series, registering for either the Full or Half Track to compete against personal goals and for awards for Overall, Masters and Age Groups. Where can I pick up my packet in advance of race day? Race day check-in will start at 7:00 am, but with our growing number of superheroes, check-in lines get very long! We recommend you pick up your bibs and event giveaways in advance on Friday or Saturday. Race day check-in and registration opens at 7:00 am. If you wait to pick up your packet or register on Sunday, please arrive early to ensure you are at the start line on time (5K starts at 8 am and Kids 1K at 9:15 am). 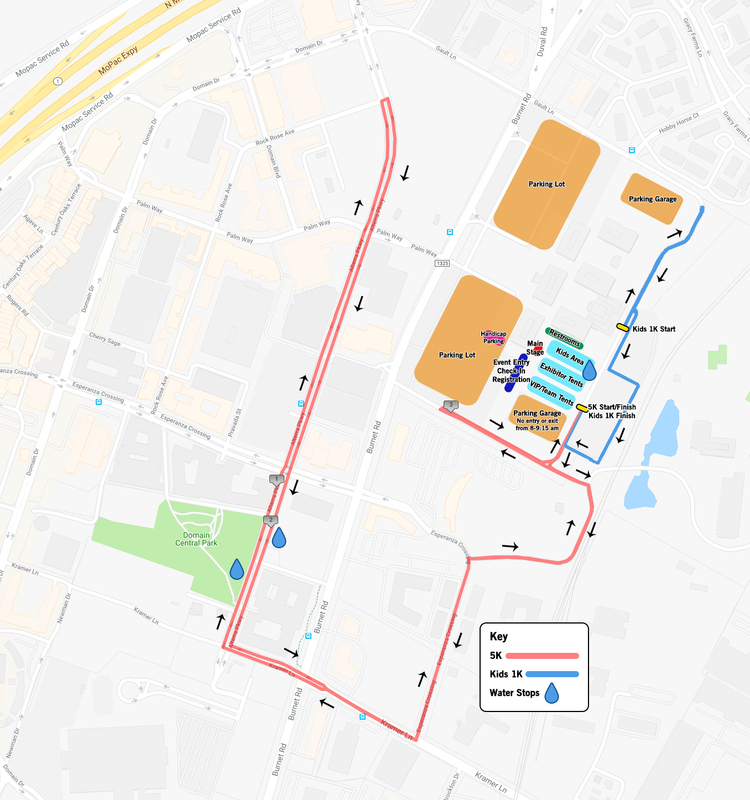 Parking is available in two large parking lots accessible via Burnet Road, as well as two parking garages on the north and south ends of the buildings. See the orange rectangles on the course route map above for parking locations. Once parked, volunteers will help direct you to the event entrance point where check-in and registration will be. Important: The south parking lot will be inaccessible from 8:00-9:15 am because of the 5K course. Please do not park here if you plan to arrive after 8:00 am or will need to leave before 9:15 am. Handicap Parking: A limited number of handicap parking spots are available in the south parking lot (see the pink rectangle on the course route map above). Once parked, volunteers will direct you around the building to the check-in area via an accessible path. Can I walk in the 5K, bring a stroller, bring a dog? Runners, joggers and walkers are welcome in our family-friendly 5K ( if someone can fly, we’d love to see it), and we're good with you bringing strollers and dogs. Please look for the staging signage that best matches your situation and start behind that. Please respect our chip-timed runners at the front of the start line so that they can take off as fast as the Flash! If bringing kids or a stroller or a dog, please stay towards the inside lane for safety purposes. What are the staging groups for the 5K? Please look for the volunteer with signage for your category and start behind them. What are the staging groups for the Kids 1K? We will be staging the Kids 1K start by ages and having a separate start for each group (so everyone gets to chase villains). Please look for the signage and volunteers for your age group: 7 and up, 5-6, and 4 and under. If running as a family group, please stage by the oldest child in the group for the safety of our younger runners. We will start with the oldest kids. Can parents run with their children in the 1K? Parents are welcome to run with kids 6 and under in the 1K, though we do ask that you register as part of the 5K group to show your support for CASA. Kids who have registered for the 1K can also go with their parents through the 5K course (please start towards the back of the group behind the appropriate staging volunteer and signage if you have small children or strollers with you). Is this a dog-friendly event? We love dogs: we even have a Super Dog category in our superhero costume contest if little Fido likes to get dressed up. We ask that all dogs be well-behaved, leashed and vaccinated, and that you please clean up after your pet. We recommend that you bring a portable water bowl for your pet in case the Texas heat overwhelms them on the course. You will see 5K staging volunteers with signs for dogs - please start behind that signage. Are roller blades, roller skates, scooters, skateboards or bikes allowed on the 5K or Kids 1K course? Due to safety concerns we cannot allow participants to have roller blades, roller skates, scooters, skateboards or bikes on the race courses. Where is the first aid tent? Benchmark Urgent & Family Care will be providing first aid for the race. Their tent will be located near the 5K start/finish line. How far is five kilometers? 5 kilometers equals 3.1 miles. Will there be mile splits? There will be markers at each mile. All race participants will receive a race number bib and access to the event day festivities and vendors. 5K participants will receive a custom-designed "Central Texas Superheroes" reusable grocery bag. Kids 1K participants will receive a t-shirt. Children with Kids 1K bibs will each receive a medal upon crossing the 1K finish line. 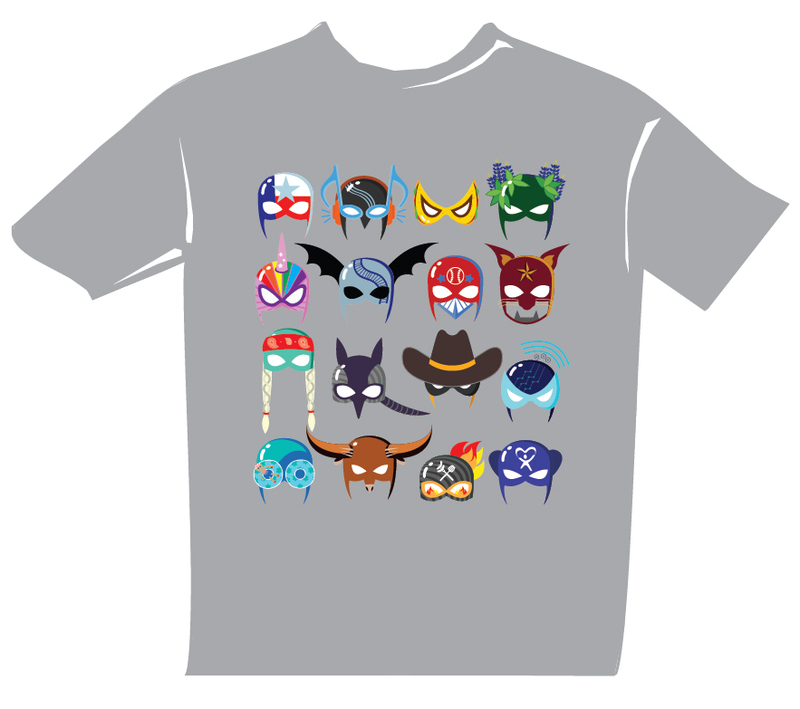 Everyone who raises (or donates) $100 in addition to their race fee receives a custom-designed "Central Texas Superheroes" Tek-tee! Yes, you can register for the 5K up to 8 am on race day, and up to 9 am for the Kids 1K. Can one person pick up packets for an entire team? We encourage team packet pick-up on Friday and Saturday prior to the event. We do ask that if you are a team of more than 10, please email sblake@casatravis.org by Thursday, September 13th at noon to let us know which packet pick-up location and day you plan to come to so we can have your team packet prepped in advance with the correct bibs and kids' shirt sizes. Where will race results be posted? Race results will be posted at the check-in/registration tents. The 5K awards ceremony will be at 9:15 am at the main stage. If you miss this, you can come to the main stage after to pick up your medal! Do 5K race or costume contest winners have to be present to pick up awards? Winners do not have to be present during the awards ceremony. We will contact anyone who did not pick up their prizes, medals or trophies after the event. We will contact all fundraising winners after the event with prizes since fundraising will not close until September 30. You can register for the costume contest at the tent next to the main stage. Judging will start at 7:00 am and end at approximately 9:15 am when the Kids 1K starts. See all the costume contest categories on our prize page! Will there be photos and video of the event? We will have a videographer and multiple photographers roaming the event on race day. Event video will be sent via email in the weeks following the event, and photography will be available for free download on Flickr soon after event day. While registrants have already signed a video and photography agreement as part of their race waiver, if you have a child in foster care or have any reasons not to be photographed, please just let our photographers know. What happens if a child is lost? If your child gets lost please alert a volunteer in a red CASA Superhero Run shirt, and give them a description of your child and your cell phone number. Our volunteers will alert CASA staff that we have a lost child and we will communicate with our team members across the park. Please tell your child in advance that if they get lost, to go to the main stage and tell one of the volunteers or an emcee there that they can't find their parents. We request that at least one parent stay wherever they said they would meet their child, and allow our volunteers to take care of the communication and searching process. We will alert parents by cell phone as soon as we have news of lost children. All found items will go to the main stage. Please ask a volunteer there if you've lost anything. What are the Refund/Transfer Policies? There are no refunds though you may transfer your race number to another person by calling 512.539.2993 before Wednesday, September 12th. If you have any other questions about the race, please call 512.539.2993.